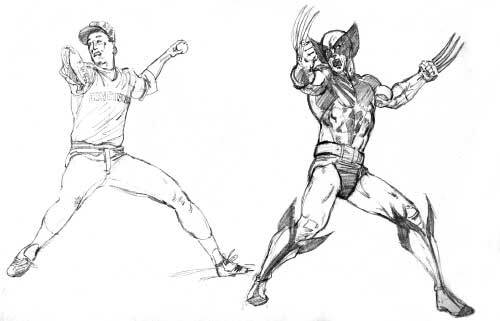 This section describes the exercise of studying and drawing action photography, and learning how to exaggerate that action into superheroic, larger-than-life action! 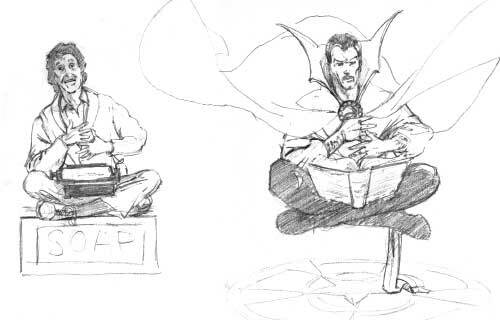 Next, you will duplicate the human figure just studied, except that the figure proportions and actions should be exaggerated to superhero/supervillain levels! HERE'S WHERE THE REAL FUN BEGINS!! If you are having trouble at first, use your tracing paper directly over the photo to construct the cylinder body, capturing the figure as realistically as possible. If you are still having trouble, simply use another sheet of tracing paper directly over your cylinder body to construct the surface detail. 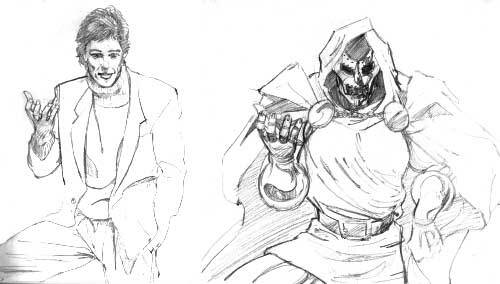 Next, study the figure and decide which physical characteristics must be changed or exaggerated to transform the human athlete into a superhero/supervillain of your choice! Make those changes to the cylinder body, and add the new surface detail! Wrestler Ric Flair becomes Lion-O!! Alright, alright already! I know.... I know...Lion-O...???? What WAS I thinking...??? Ric is drawn as realistically as possible. Then, features are adjusted and exaggerated: His limbs are lengthened (to get back to the more superheroic body model), his chest is enlarged and his waist is reduced. The result: Lion-o! You only have to do one or two of these to discover how much fun this is!! 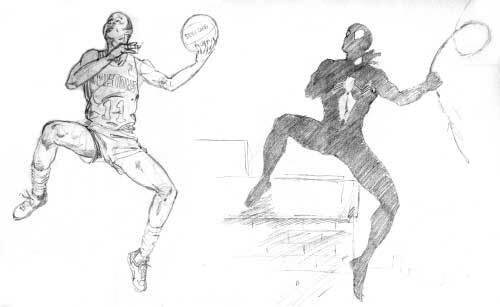 Basketball star Isaiah Thomas becomes Spider-man!! Isaiah is drawn as realistically as possible. Then, features are adjusted and exaggerated: as it turns out, I decided that he made a convincing Spidey as-is. The result: Spider-Man! Baseball star John Franco becomes Wolverine!! John is drawn as realistically as possible. Then, features are adjusted and exaggerated: His arms and chest are thickened, his waist reduced. The result: Wolverine! Famous guy Luca Barbareschi becomes Dr. Doom!! Luca is drawn as realistically as possible. Then, features are adjusted and exaggerated: His hand is enlarged, his arms and chest are thickened. The result: DOOOOOOM!!! YIKES!!! Author Kurt Vonnegut becomes Dr. Strange!! 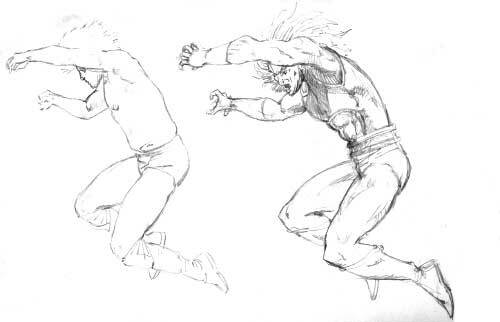 Kurt is drawn as realistically as possible. Then, features are adjusted and exaggerated: the body is generally elongated and thickened... and floating! The result: Dr. Strange!! Weight lifter Paul Orndorff becomes the Punisher!! Paul is drawn as realistically as possible. Then, features are adjusted and exaggerated: as it turns out, I decided that he made a convincing Punisher as-is. The result: Punisher! You just gotta agree -- Dual Action Studies are a blast! I have many more such illustrations in my sketch books -- and you should, too! This is a great way to learn the human body in action -- from REALITY-- and also a great way to learn the superheroic body in action -- also based on REALITY! Now that you are getting the handle on drawing and exaggerating figures in action poses, why not go onto the next section and try your hand at some more Superhero Character Shots!